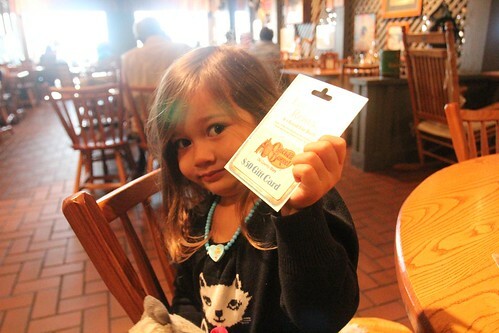 Mali Mish - Day 186: Meeting new friends in Beaumont, Texas. When we contacted our friend Jerry on Facebook, he knew exactly where we were but could not meet us for breakfast since he had to get to work fairly early in the morning. He replied that he will stop by and leave us a note in the morning which we found sitting under the windshield wiper of the van. Not only did Jerry stop by and leave us a nice welcome note, he also insisted on buying us breakfast by leaving a Cracker Barrel gift card along with it. 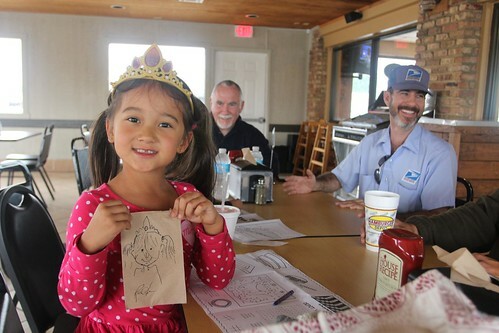 We continue to be overwhelmed by the support and friendship the Airstream community has shown us. We have gotten everything from encouragement, advice to courtesy parking. Getting a gift like this from someone we have not yet met in person is a first for us. We were determined to return the favor so I called him with the number he left me on the note. Even though we had never talked, he recognized my voice immediately from the videos we post on the blog. 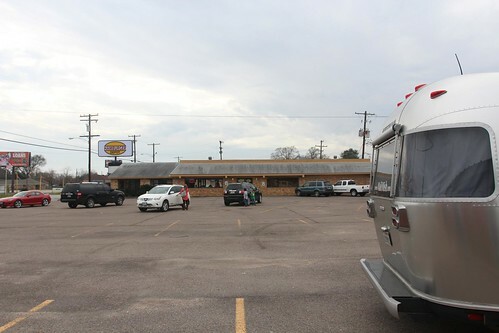 Knowing that I am a fan of hamburgers, he suggested a local burger joint called Hamburger Depot at the nearby town of Nederland, Texas. When we met him in the parking lot, his Postal Service uniform clued us in on his profession as well as his early morning work schedule on the other side of town. His partner Rob also met us at Hamburger Depot and insisted once again that we do not pay for our meals. I tried my best but conceded to buying them lunch during our next visit. 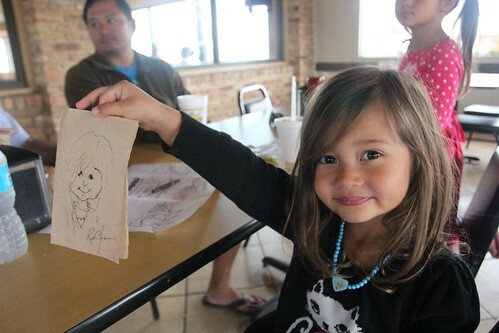 Rob is an architect and drew each of the girls caricatures of them while we waited for our burgers. They were thrilled to watch Rob as he created these wonderful portraits of them. The meal would not be complete without a photo of my burger. 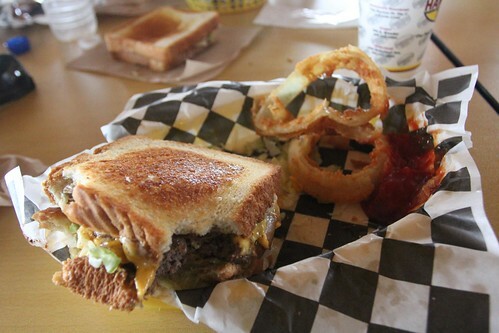 My choice was their Texas Toaster Melt with onion rings. The burger was awesome and the rings were cut and dipped right there in the restaurant. 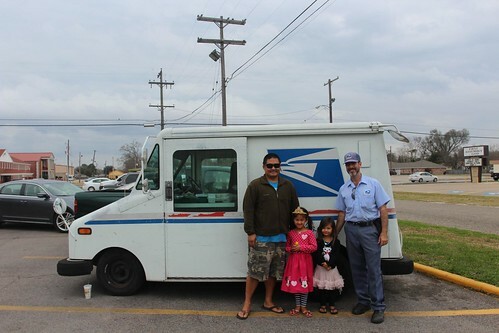 The girls got to check out Jerry’s mail truck as Marlene took the opportunity to incorporate a little bit of homeschooling into our lunch date. We wish we were able to hang out with Jerry and Rob a little longer but today we are going to be heading further west into Houston as we bid farewell and hope to see them again soon. Like most big cities, Houston is not very RV friendly. 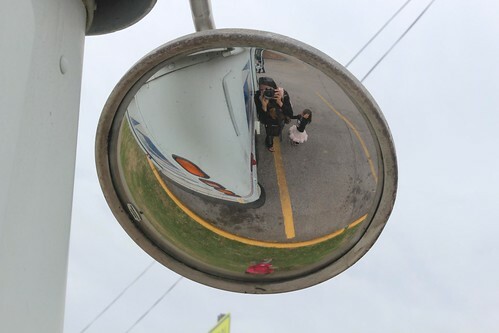 We searched for awhile for a nice campground to stay that is near downtown but was not able to find anything suitable. For some reason, many of the campgrounds were completely full. 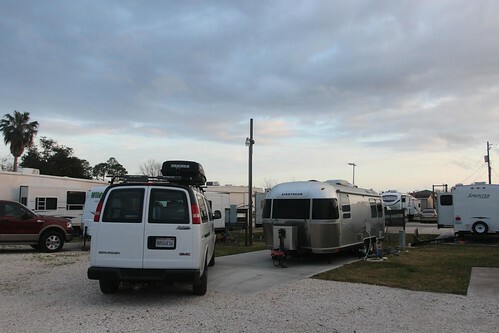 When we asked one of the operators, they told us that seasonal oil workers come to Houston, usually in their RVs and take up a lot of the campsites. We finally found a spot in the suburban town of Dickinson at the Palms RV Park. It is nothing special but at least it has full hookups. We will stay here for a couple of days before moving on towards Austin. Day 185: Tabasco Factory and Jungle Gardens at Avery Island. 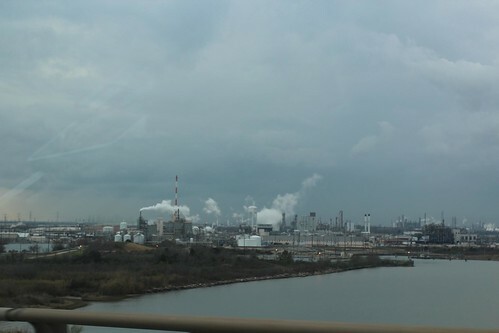 2 Responses to Day 186: Meeting new friends in Beaumont, Texas. I love our community of aluminum, what a treat to meet Jerry! And such a sweet gift for the girls…way to go, Rob! Wonderful to know there are so many great people out in the world. What nice people Jerry and Rob sound like – glad you got to meet them!